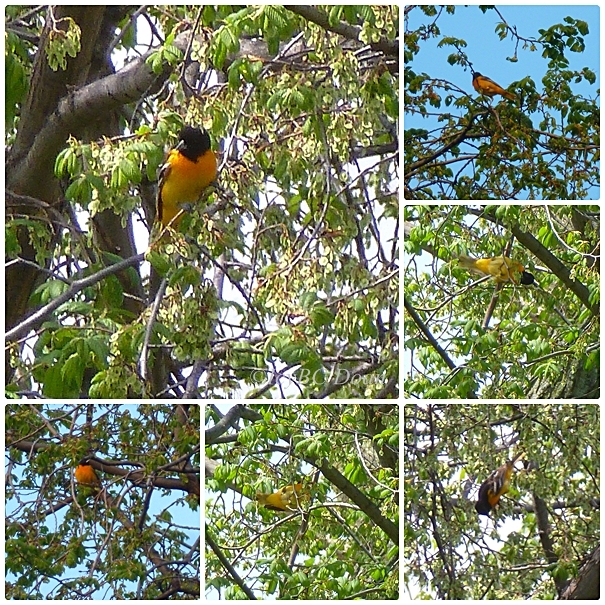 I spotted this oriole on the 17 of May when I heard different bird sound in the tree, two houses away from me. I saw dots of orange and bouncing from branches to branches. There were many of this Baltimore orioles in that tree, but with the leaves filling out, it was hard to see them. My camera failed me in the zooming department, but I was so happy to see them. I only wish to have a few spectacular shots like Karen @Pixel Posts! I love the Orioles.. they are an awesome bird to see in your yard.. Love the mosiac and photo. Thank you for linking up. Have a happy weekend! I have heard about Baltimore orioles all my life but have never seen one. Thanks for your shots, they are just awesome! So photographing mushrooms is the best choice. They are always next to us. great bird to find and you did well to photograph them. Are you brave enough to cross the bridge today with me? Have a wonderful weekend. Great views, in my area oriols are very rare birds. Beautiful birds and great photos of them!